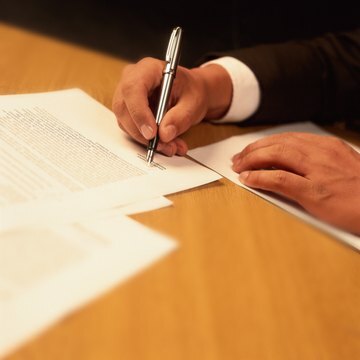 A power of attorney is a document that allows another person, called your "attorney-in-fact," to act on your behalf. One of the many powers you can delegate to your attorney-in-fact under a power of attorney is managing your financial affairs, including your bank accounts. A full power of attorney should cover any dealings with your financial assets abroad as well as those at home, but if you want to empower a given attorney-in-fact to deal only with your offshore bank accounts and no other assets, you can restrict his authority. Select an appropriate, trustworthy person to manage your foreign bank accounts. Remember that by granting power of attorney to another person to manage those accounts, you're allowing the bank to release your money to that person and to obey his orders as to what to do with funds on deposit. If your attorney-in-fact disappears with your money, you will have no recourse against the bank. Contact the offshore bank in question to learn whether it will honor a power of attorney drawn in the United States. The bank may require a document that conforms with the laws of their country, although they may be able to provide you with a form power of attorney for use with their accounts only. If your American power of attorney won't suffice for their purposes and they have no form available, consult with an attorney licensed to practice law in the bank's jurisdiction. Obtain a power-of-attorney document naming your chosen person as attorney-in-fact over your foreign bank accounts. If you don't want to or can't use an existing general power of attorney, you can have a lawyer draw up a more restricted document for you. If you want to do it yourself, consider purchasing a pre-drafted form from a reputable online legal document provider. Go through the form and black out the powers you don't want to grant. In the appropriate field, state that the listed attorney-in-fact is empowered to deal only with certain accounts. Execute the power of attorney in front of a notary public. Forward a fully executed original to your attorney-in-fact. Ask the bank whether you'll be required to record, or register, the power of attorney in your home county or somewhere in the bank's home country in order for it to be effective. Remember that any time you record a document, you may be placing it on the public record for anyone to view. The privacy and secrecy that individuals are typically seeking when they use a foreign bank account could be compromised by the existence of a power of attorney that makes reference to accounts with a certain bank.